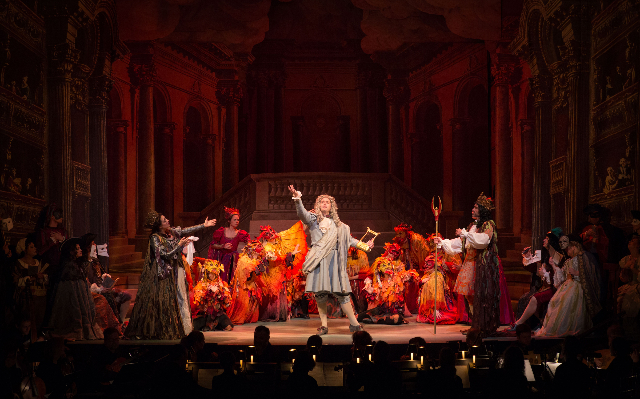 Tenor Aaron Sheehan as Orfeo and soprano Teresa Wakim as Proserpina surrounded by the Demons of Pluto's realm in the opera-within-an-opera in "Le Carnaval de Venise"
Soprano Amanda Forsythe and bass-baritone Douglas Williams in Campra's "Le Carnaval de Venise"
Dancer Julian Donahue in Campra's "Le Carnaval de Venise"
Members of the large vocal cast, even the principals, sing multiple roles. This season, in its 19th biennial outing, the Boston Early Music Festival took things a little more lightly than it has in the past. Both its Centerpiece Opera, the long, uncut, historically authentic production of an important work, often exhumed from an archive, that not very many people have seen or even heard of before, and its more modest semi-staged Chamber Opera, originally presented on Thanksgiving weekend and reprised at the festival, have tended to take a tragic tone. Gods and goddesses, shepherds and nymphs, Kings and Queens, ordinary men and women, strive and clash, fall in love and hate, expressing noble and crass sentiments in music along the way; many of them die, often singing a heart-breaking aria. Not this year. The festival has organized its presentations under the umbrella of “Carnival,” and both the Centerpiece and the Chamber operas are comedies: the principal characters marry at the end. And in the pair of Pergolesi intermezzi, only the stodgiest audience member won’t laugh at the often uproarious shenanigans its characters get themselves into. If you think of Lucy and Ethel or the Marx Brothers you’d not be far off the mark. And the third major production the festival is presenting itself (as opposed to the more than a dozen it is sponsoring, which we’ll cover here in a separate article), Handel’s oratorio on the theme of the Resurrection of Christ, “La Resurrezione,” has a happy ending as well. Christ might have died on the Cross but on the third day he rose from the dead to save the world. If you’re a Christian, what happier ending could you conceive than that? As usual, BEMF productions are the result of a lot of scholarship. This year, the festival immersed its audiences in the art, politics and history of Europe circa 1700, when all three works were created and premiered in Paris, Naples and Rome. The extensive program notes share the discoveries with members of the audience who want to know the context in which the works they are listening to were created. 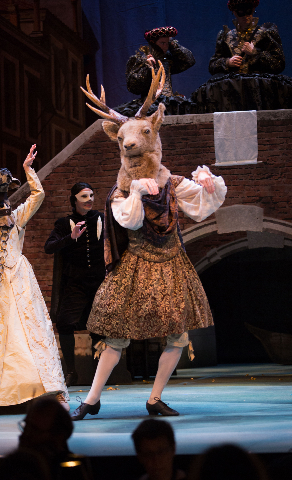 André Campra’s “Le Carnaval de Venise” is an opéra-ballet, a music- theater genre in which dance, usually reserved in opera for brief interludes or altogether absent, shares stage with the singing and acting. It’s a tradition dear to the French, who love their ballet as much if not more than their opera, but unlike many French aesthetic innovations, it has failed to become a cultural export. This is the first time in its 19 years of reviving what might seem to some to be unreviveable that the BEMF has tackled such a hybrid. It required extra effort – the BEMF created a dance troupe trained in Baroque movement for it – but it is unlikely that opéra-ballets will become a regular feature of the festival, so it was wise that it chose a work by the composer who perfected the form. This was its North American premiere. No one would confuse “Carnival” with a work by Lully, however. It is far too light and frivolous for that master who, although he composed comedies, set French opera on its serious path. Although it is long – three and a half hours including an intermission - “Carnival” was a rousing good time in the theater, at least for this critic. The festival was promoting it as a spectacle and BEMF co-music director Paul O’Dette said in a taped interview that it might be better to think of it as a Baroque musical rather than a Baroque opera. I wouldn’t go that far: the singers could actually sing – there was no miking of voices – and I doubt that any three-and-a-half-hour musical would make it on Broadway today. But I know what O’Dette meant. 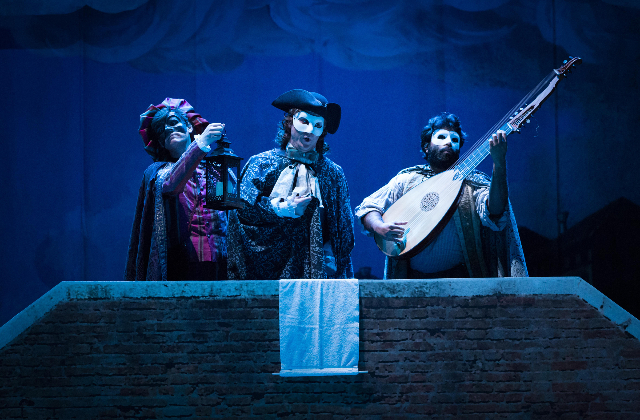 It was full of action – singing and dancing, low comedy, slapstick, drag roles and an opera within an opera that also served as a delicious satire on Italian opera and the narcissistic divas and castrati that populated its stages. The plot is negligible: two Venetian women, friends, Isabelle (Amanda Forsythe) and Leonore (Karina Gauvin), find out that they are in love with the same French cavalryman, Leandre (Jesse Blumberg). Rodolphe (Douglas Williams), the Venetian who is in love with Isabelle, and Leonore, the woman jilted by Leandre, conspire to shoot him. The wrong man is killed – little is made of his anonymous death – and the French soldier and his beloved Isabelle get out of Dodge on a gondola. That simple action takes place during the Venetian Carnival, a time of general licentiousness when masked revelers from all over Europe show up to be bad in a public space where no one recognizes them. There is a serious, historically rooted intent to the opera, but it is obscure and you have to read stage director Gilbert Blin’s program notes to realize it. Why is there a French cavalryman in Venice? Well, France and Savoy had just signed a peace treaty to end their animosity in the Nine Years’ War, in which France was opposed by England, Spain, the Holy Roman Empire and the Dutch Republic as well as Savoy. Campra’s opéra-ballet helped celebrate France’s rapprochement with Europe. For the sake of fun, frivolous Venice stood in for sober Turin, the Savoy capital. (Those who know European history of the time, with its endless wars and reshuffling of alliances know that it’s more complicated than that, but this is an opera review, not a history lesson.) The recent peace treaty also explains the Armenians, Turks and Slavs participating in the activities. The opera also opens with an allegorical Prologue in which Minerva (Mireille Lebel) and gods that exemplify the arts extol the virtues of a French Royal, in this case the son of the King Louis XIV, the Dauphin. These de rigueur scenes of flattery, expected by the Royal family, are off-putting today although they might help explain why the French were so violent toward the Monarchy when the Revolution finally arrived less than 100 years later. The sometimes endless flattery also helps explain why so much of French Baroque opera is such a hard-sell today. A nice, unexpected touch, however, was that Blin dressed the team of workers striving to get the production ready in time for its premiere in contemporary costumes, each wearing a black t-shirt with the BEMF logo on it. “Carnaval” was first presented at Court, where all its political implications would be understood, but then it moved to a public theater, where it low-comedy elements were perhaps better appreciated. In Part I, the action takes place on a frozen canal in Venice - one of the amusing touches is watching the actors test the ice in the early scenes. It must have been quite thick, because by the end of the act it seems that the entire cast has gathered on the ice to party, sing and dance. The plot plays out in a space that is shared with divertissements – dances, puppet shows, a dancing bear, a dancer wearing a stag’s head, a commedia dell’arte troupe, etc. These scenes are delightful, a triumph for the production team. Blin’s sets are simple, but his direction is focused and specific – every person on stage, no matter how minor, has a gesture, look, stance that distinguishes him or her. There are no generic choristers in a Blin production. And once again costume designer Anna Watkins, a BEMF most valuable player, wins highest honors. Although the bourgeois characters are soberly but luxuriously dressed, the soldiers, maids and roustabouts, not to mention the Armenians and Dalmatians, are more colorfully garbed. A particular hit was the super-cute outfit of Zerbin, Leandre’s valet (David Evans), a tight red striped satin jacket and pair of knickers with a matching large floppy hat. It was immediately clear what an opéra- ballet looked like in reality. In the crowd suddenly a quartet, sextet or octet would start dancing, part of the action, not separated from it. Throughout the entire opera, the dance emerged seamlessly from the action, the members of the crowd, including the singers, stepping aside to let the dance proceed, and then, when it was over, it was over, the dancers merging back into the crowd. The dancers were adept at Baroque dance, which looks more vintage to us than Baroque music sounds. There are no lifts, and little touching between dancers in general. The movement is composed mostly of little hops and jumps, its structure frequently that of circle dance. The nine members of the BEMF Dance Troupe joyfully executed their moves with grace and fluidity. I heard grousing from hard-core opera lovers that there was too much dance, but I didn’t have a problem with it at all. Indeed, I was surprised there was not more. Before we get to Part II, where the scene changes to the interior of an opera house and ends, as the Carnival did in Venice, with a ball, let’s mention the singing we’ve heard so far. The large cast was uniformly excellent. Most singers had only short bursts of song, but the four principals had real singing roles. As we have come to expect, as the lucky-in-love Isabelle, soprano Amanda Forsythe sang with ravishing tone – appropriate for the comedy, her voice was light, bright and fleet. And in Part II, when she thinks that her beloved Leandre has been killed, she sings a standard opéra lyrique despairing aria with real (mock) feeling. As Leandre, baritone Jesse Blumberg was also in fine voice, and he played the stalwart French cavalryman with a certain gravitas, at least compared to the other characters. As Leonore, the rejected woman, soprano Karina Gauvin started out a little weak voiced when she expressed her love, but she came into her own when she realized her faithless lover had chosen another over her, showing unquenchable anger even when Rodolphe suggests they hook up since they’ve both been jilted. And as Rodolphe, bass-baritone Douglas Williams, as fine an actor as a singer, moped in his depression, and brilliantly delivered a broken-hearted aria in which he expresses his jealousy and pain at having been rejected. But, the best was yet to come. In Part II, Campra takes his characters to an opera – Venice was the leading opera center in Europe at the time, and going to the opera was something visitors to the city did like tourists today in New York take in a show. The opera, in Italian of course, is one of the many versions of “Orfeo” that dominated the Italian stage. French nationalist that he was Campra lets the Italian tradition have everything he’s got. This is unbridled satire and it is a total hoot. The scene shows a crowded stage with elaborately costumed mythological creatures – Watkins outdid herself with the costumes for the Demons under Pluto’s reign – with the audience crowded in at both sides doing the things the audience did in Italian theaters – eating, drinking, flirting, making obscene gestures to one another, paying little attention to the action on stage unless one of the performers proved to be fetching and then there might be an exchange of notes setting up a future assignation. Blin choreographed a scene of controlled chaos that got the Cutler/Majestic audience –at least this member of it - ready to join in the fun. “Orfeo nell’inferi,” as it’s called here, was the focus of a more critical satire. One of the joys of this production was that the actor singing Orfeo was none other than Aaron Sheehan, the BEMF’s go-to Orfeo, having sung the role in works by Monteverdi and Charpentier. I don’t think I’ve ever seen Sheehan have so much fun as he did here satirizing a role for which he is the vocal ideal, and he was hilarious. His bearing as noble, his tenor as sweet as ever, he turned in an over-the-top performance that nailed the vanity of a temperamental castrato, making fun of the Italian form’s endless repetitions, picking up the main theme again – and again - when everyone in both stage and real audience had already heard enough of it. Except we didn’t. His cluelessness and vanity were delicious. He could have sung “Vittoria” all night and no one would have objected. Sheehan’s chutzpah was nearly matched by soprano Teresa Wakim who played Pluto’s consort Proserpina. Both of them fought to maintain a position center-stage, elbowing out of the way anyone who came close. In addition to the singers mentioned already, special shout-outs go to soprano Mireille Lebel, who proved to be one of the biggest hams on stage – plotting for attention, flirting shamelessly with a man in one of the boxes, having the time of her life – and orange-suited tenor Jason McStoots, who has never been in a scene he didn’t try to steal, and here he really let go. Baritone Christian Immler, who played both the head of the construction crew in the Prologue and Pluto in “Orfeo” did his best to maintain decorum while singing with characteristic richness, his voice like creamy chocolate. It has to be noted that the BEMF Orchestra, under the direction of Paul O’Dette and Stephen Stubbs, played with vibrancy and spirit and that concertmaster Robert Mealy outdid himself, even intervening verbally during “Orfeo” with a bad Italian accent to get the show back on track. And in its first appearance as a designated troupe the BEMF Dance Company distinguished themselves. “Carnaval” was a lot of fun, but if lacked the great music we have come to expect from Baroque opera. There were a couple of inspired moments musically – Forsythe and Williams’s despairing arias – but most of it was music composed to move the action. Maybe that’s what O’Dette meant by suggesting it was more Baroque musical than Baroque opera. I’m glad the BEMF went to the considerable trouble to mount it, but I look forward to it returning to the kinds of more emotionally and musically complex operas it has center-pieced in the past. That doesn’t mean the BEMF has to be serious all the time. There is always room for comedy in the theater. And the Chamber opera the BEMF revived this festival is one of the most enduring comedies in the opera literature, Pergolesi’s “La serva padrona.” A little trifle, an intermezzo composed to fill the gaps between the three acts of a grand opera seria so the audience wouldn’t walk out, it has survived while “Il prigionero superbo” (The Proud Prisoner), the opera it served as a palate cleanser for, has not. Only 45 minutes long and originally broken into two 22-minute halves, it was ingeniously joined together here with another, lesser known Pergolesi intermezzo, “Livietta e Tracollo,” to create a short evening length entertainment, each 20-odd-minute section alternating with one from the other opera, so that both stories were told together in parallel. And entertain it did. The plots are silly, foreordained things – no surprises here. In “Serva,” the stereotypical wily servant girl tricks her witless boss into marrying her. The end. In “Livietta e Tracollo,” a common thief ends up marrying the woman he started out to rob. One suspects that neither marriage will be happy. We’ve seen this story updated in a film starring Sophia Loren and Marcello Mastroianni. Some things never change, in Naples at least. The success of the evening lay in the direction, the singing and the acting – the essentials. As is his wont, Blin micro-directed every gesture until the cast internalized his vision. But it was the cast of four – abetted by the dance troupe miming their roles – that made it work. Forsythe is a great Barqoue opera tragedienne but she is also a natural comedian, singing through her nose here to suggest her character’s low status. As Serpina, she knew how to sell herself, advertising her prettiness and liveliness, and she sang that someday she’ll be missed, even if she has made her poor employer wait three hours for his morning chocolate. It didn’t take much for her to outsmart her lawyer boss, the mayor of the village, a typically clueless man. Williams is also as adept at comedy as he is at more serious drama, and with his belly distended by a pillow and his dithering indecisiveness, he caused laughter nearly every time he appeared, singing with his richly colored and supple baritone. Of course, in the end Serpina tricked Uberto into marrying her – the choice being her or paying a large dowry to a phony suitor, a hairy Captain Stormy, who is a visual laugh in himself. 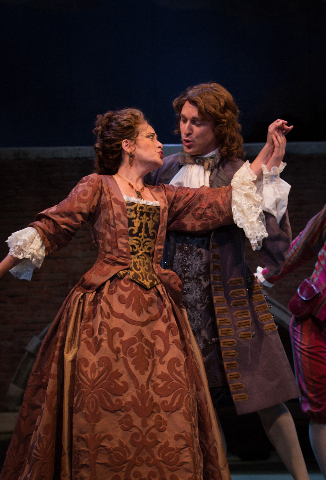 Being the lesser of two evils – Uberto is also the stereotypical miser - Serpina was nonetheless happy that she is finally the mistress of the home. One is not so optimistic about Uberto’s future happiness, however. This charming trifle, distinguished by skipping vocal lines, folksy melodies and rapidly changing rhythms, is mixed in with the story of Tracollo, a thief, and Livietta, a country girl. As Livietta, another woman who outsmarts a man with ostensibly greater resources, soprano Erica Schuller was a lively presence and fine singer, but she couldn’t really compete with Jesse Blumberg’s Tracollo. Indeed, none of the cast was able to compete with Blumberg, who owned this production. From his entrance dressed as a pregnant Polish woman, singing his Italian lines with a fake Polish accent, Blumberg caused hilarity nearly every time he opened his mouth to sing. When he is convinced that he is to die for the robbery and near murder of Livietta’s brother, he sang a parody of a standard Baroque aria, milking it for everything it is worth. 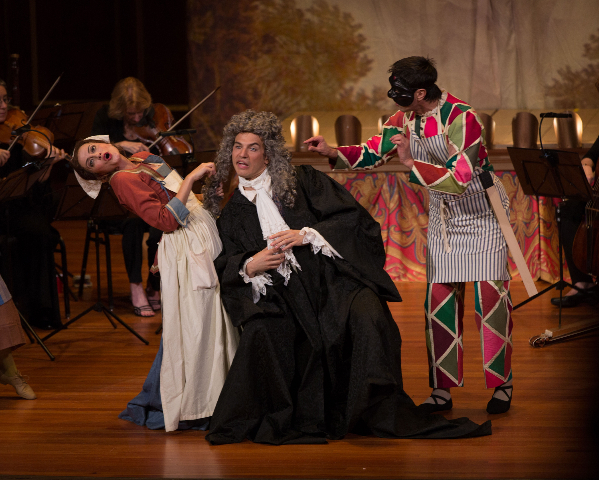 This is the second parody of Baroque style we’ve heard this festival – in “Carnaval,” a French satire on Italian style, in “Livietta,” an Italian satire of an Italian style seen by the composer as old-fashioned. Bravo to the BEMF for being able to take a joke. And bravo to the BEMF for giving us a second chance to hear this enchanting and hilarious – how many times have I used that word? – little opera. And may it bring back Blumberg in another comedy! It’s hard, impossible, to talk about “La Resurrezione,” a sacred oratorio about Christ’s resurrection, as a comedy. But it is light in nature and has a happy ending, so it composes the third pillar of this year’s festival’s light-hearted Carnival theme. The oratorio, written in Rome when he was 23, is one of Handel’s most infectious, but it has been lost in favor of the more mature and stately English language oratorios he wrote in London – you know, the Messiah and all that. But Handel was a prodigy and a quick read, and in Rome for a few years, he arrived with a reputation and left with it burnished by commissions and successes. But he was only 23 and “La Resurrezione” is brimming over with youthful enthusiasm, glorious melodies and sharp characterizations of sacred characters who are often presented as two-dimensional figures. Handel’s goal was to show up the Roman establishment at their own game and he largely succeeded. Handel came to be known as an opera composer, arguably the greatest opera composer of his time, so you might wonder why didn’t he write an opera to show the opera-loving Italians his skill as a vocal composer. Well, in an example of the adage that all politics is local, even as it flourished in Venice, Naples and Florence, opera was banned in Rome by a conservative Pope, Innocent XII, who even forbade women on stage in a sacred work. Party poop. Nevertheless, Rome was one of the most sophisticated cities in Europe and its wealthy nobility, including members of the clergy, found ways to get around the ban, hosting performances in their palaces. The Pope’s spies still made sure that there was no acting and that women didn’t sing alongside men, but they were able to get away with presenting works that looked and sounded like operas even if they were on sacred themes. Marchese Francesco Maria Ruspoli, one of the great arts patrons of his time, commissioned the oratorio for Easter Sunday in 1708. Tutta la Roma was there. And the oratorio was a great hit even though the Pope’s police found out that Handel’s choice for Mary Magdalen, Maragherita Durastanti, was a woman and forbade her to sing the second performance. I won’t waste time on the story – I think everyone knows enough of the Christian myth to know that for believers Christ rose from the dead on the third day. An admirable aspect of the BEMF is its cultivation of a small band of singers, some of them local, many from around the country and world. With two operas this year’s festival required the engagement of many of the dispersed band, but with such short singing roles in “Carnaval” and a vocal cast of only four in the Pergolesi pastiche, many of them didn’t have a lot to do. So, for its annual showcase for the BEMF Orchestra, co-directors Stubbs and O’Dette mounted a vocal work that could use some of those underemployed singers. For the most part, it was a brilliant evening. The orchestra, led by Stubbs, was in fine form, rhythmically alert with the light, transparent sound perfect for Handel. As concertmaster, Robert Mealy really leaned in for this work, practically jumping out of his seat on occasion. And the orchestra has a reason to be excited. Handel wrote lovely duets for singers and instruments, the trombones, gambas and therobos getting a work out. The gorgeous aria for Maddalena, “Per me già di morire,” was accompanied by a lovely instrumental duet between Mealy on violin and a gambaist I couldn’t see. That said, the vocal soloists were a mixed bag. Karina Gauvin’s soprano was too dark and heavy to suggest an angel, although her voice gradually opened up. As Cleofe, the “other Mary,” mezzo-soprano Kelsey Lauritano was weak-voiced and, again, her voice was too dark and heavy. She did put across her big aria in the Second Part, “Augellite, ruscelletti” (Little birds, little streams) with confidence and beauty of tone. Lauritano is still a student at Juilliard and seems not to be ready for the big-time. It is not encouraging to realize that Robert Mealy is the head of the historical performance department at Juilliard. Does the BEMF really serve as a finishing school for his students? In any case, there was a difference of opinion about Lauritano’s performance. The Boston Globe praised it strongly. Wakim, a BEMF regular, was having a good festival this year. She was funny as Proserpina, competing with Sheehan’s Orfeo for stage placement, and here as Maddalena, she sang with a gorgeousness that made you want to hear her sing the lead role in a Centerpiece Opera someday. In her first aria, “Ferma l’ali” (Fold your wings), she sounded more like an angel than the singer taking that role. And she brought a light, transparent quality to the joyous “Ho un non so che nel core” (There’s a certain something in my heart). The most riveting performance, however, came from baritone Christian Immler’s “Lucifero.” Although he was defeated in the end by the forces of Heaven, Immler’s Lucifer was formidable in every way. He scowled, he threw hateful glances and he sang like a devil, rolling every r as another weapon in his arsenal. (In general, Immler sang with an enunciation that only few opera singers are able to muster.) Alas, his role was too small, but his presence was undeniable. Who was it who said about MIlton’s “Paradise Lost” that the Devil gets all the best lines? Coming soon: a quick survey of some of the concerts by other groups the BEMF presented.